This is the final post for Guys Lit Wire. So that was what we set out to do (as evident from the site's name): recommend some books that we thought teenage boys would like. This often meant books from a boy POV, or graphic novels that might lure in reluctant readers, or nonfiction that might appeal to specific audiences that don't read a lot but like certain subjects. What all of these books had in common is that one of our many contributors thought it was a good book and deserved some more attention from readers who would probably love it if they knew about it. We certainly hope that all kinds of kids and teens (boys and girls) have picked up a book because of something we posted here. Beyond that, we also supported several schools and organizations devoted to getting books into the hands of kids who needed them via underfunded library shelves. Cumulatively, over 10,000 books have been bought & shipped due to our efforts. Most recently, for Ballou Sr High School in Washington DC, over 200 books were bought off their wish list by our readers and sent their way at the end of 2017. Support for the Annual Book Fair for Ballou will continue, as I take those posts over to my site, Chasing Ray, and continue to host the book fair there. Please follow me on twitter, (@chasingray), for updates on that effort. Personally, Sarah Stevenson & I would like to thank everyone who was with us on this ride. We are both writing much more heavily now on our own projects and bring an end to GLW with a heavy but grateful heart. Simply put, it is time. All of us at the site are confident however that we accomplished far more here than we ever thought possible. The archives will remain live and there are a ton of great book recommendations to peruse; be sure to check them out. Lots of authors are publishing gritty, raw stories grounded in current events and this book by Nic Stone is another that falls into this category. The young man on the cover bears an uncanny resemblance to Trayvon Martin what with the hoody and all. 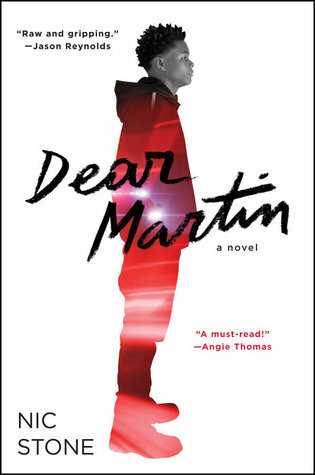 Also on the cover is a quote from author Jason Reynolds proclaiming the novel to be "raw and gripping". That quote alone was enough to make me pick this book up as it will for many readers, I am sure. Justyce is bright, articulate and for the most part just a regular high school kid trying to make it to graduation and then make his way to a prestigious college if all goes well. In the novel's intro we meet him trying to do right by his on again, off again girlfriend Melo who is about to make a bad decision. His actions are somehow misconstrued by a passing police officer and before he knows it Justyce ends up face down with a face full of asphalt. This is only the precursor to what is destined to be an eventful Senior year to say the least. As it so happens Justyce's grades have allowed him to gain entry to one of Atlanta's most prestigious private schools where seemingly every teacher has at least three degrees. Most of the students are bright, many come from well to do families such as his best friend Manny whose parents are successful professionals. As you would expect, the campus is not very diverse and some of the students display white privilege (perhaps a bit too predictably by lamenting the fact that minorities have it "easy") Justyce's way of dealing with the many, many changes occurring in his life is to write letters to Dr. Martin Luther King Jr. He's studied the Civil Rights leader's speeches in class and is trying to reconcile the words and the values espoused therein with the realities of daily life. As if that isn't complicated enough, there is also the not so small matter of the evolving relationship with his debate partner SJ. I've read The Hate U Give by Angie Thomas and All-American Boys by Jason Reynolds and Brendan Kiely and this novel is just as gripping, timely and relevant. Stone does a great job balancing the heavy stuff with some touchy feely stuff so it isn't too hard to digest. Well worth a read. The legendary Building 20 (1943) was an artifact of wartime haste. Designed in an afternoon by MIT grad Don Whiston, it was ready for occupancy by radar researchers six months later... In an undertaking similar in scope to the Manhattan Project that created the atomic bomb, the emergency development of radar employed the nation's best physicists in an intense collaboration that changed the nature of science. Unlike Los Alamos, the MIT radar project was not run by the military, and unlike Los Alamos, no secrets got out. The verdict of scientists afterward was, "The atom bomb only ended the war. Radar won it." ... Author Fred Hapgood wrote in 1993 of Building 20, "The edifice is so ugly that it is impossible not to admire it, if that makes sense; it has ten times the righteous nerdly swagger of any other building on campus... Although Building 20 was built with the intention to tear it down after... World War II, it has remained... providing a special function... Not assigned to any one school, department, or center, it seems to always have had space for the beginning project, the graduate student's experiment, the interdisciplinary research center. It may have been my familiarity with MIT's homely, accommodating Building 20 just across the street that made the $45 million pretentiousness, ill-functionality, and non-adaptability of the Media Lab building so shocking to me... Nowhere in the whole building is there a place for casual meetings, except for a tiny, overused kitchen. Corridors are narrow and barren. Getting new cabling through the interior concrete walls - a necessity in such a laboratory - requires bringing in jackhammers. You can't even move office walls around, thanks to the overhead fluorescent lights being at a Pei-signature 45-degree angle to everything else. 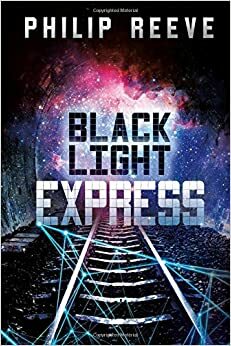 Brand finishes How Buildings Learn with a list of good books, writing, "They are the texts I would reach for if I was going to work on a building..."
Philip Reeve’s absolutely incredible world building again takes center stage in Black Light Express, the sequel to Railhead. The second book picks up soon after the events that brought Railhead to a stunning close, with former thief and unwitting catalyst Zen Starling having fled the Network Empire along with Nova, his android girlfriend. Meanwhile, completely against her will, Threnrody Noon, the Paris Hilton of the empire-controlling Noon family, has assumed the position of Empress. She is only a pawn of more powerful interests however and virtually trapped in the palace attending a haze of pointless engagements while her former fiance, Kobi, is on the other side of the galaxy about to be forced into a corporate approved marriage with someone he has never met. Basically, the fallout from Railhead is reverberating across all the lives of the major characters while, unknown to them, it’s about to get a lot lot worse. What Black Light Express (and the first book, Railhead), offers readers is sentient trains, a vapid rich girl who decides she doesn't want to be a pawn anymore, political machinations, alien technology, aliens, dinosaur-descended aliens, human-android romance, the fact that the human-android romance is the best kind of romance, more stupid rich people, the satisfaction of rich people losing because they are stupid, a protagonist who is smart and scrappy and more than willing to walk on the wrong side of the law because playing by the rules gets you only so far (and those rich jerks are the ones who wrote the rules in the first place). Oh - and a train is killed and that is far more upsetting than you would think. As I wrote in my review, I'm really surprised that these books are not more well known. They are excellent SF (which is not too common in the YA literary world) as well as being excellent political mirrors for much of modern society. Check them out! Initially, Emily Bain Murphy’sThe Disappearances reads as straightforward historical fiction. It’s 1942 and teenage Aila is facing the stark reality of life in the wake of her mother’s recent death. To make matters worse, her father is off to the war in the Pacific and she and her younger brother Miles must go live with their mother’s oldest friend in Sterling, Connecticut, where she grew up. Aila knows very little about her mother’s childhood but is resigned to doing her best to fit in. Readers will feel immediate empathy for these children and their predicament but likely expect little in the way of fantasy from reading the first few pages. Then Aila and Miles arrive in their new home with the Clifton family and, in spite of the pouring rain that greets them, Aila is stunned to notice that Matilda Clifton remains completely dry. Clearly, everything in the seemingly dull town of Sterling is not as it appears. I have enjoyed several books by people who have through-hiked the Appalachian Trail (A.T.). 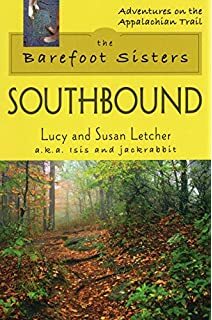 But Isis and jackrabbit (their trail names) set off barefoot from Mount Katahdin in Maine on their way to Springer Mountain in Georgia (They used boots after the snow started falling on them in Virginia.). A beat-up green Dodge ground to a halt on the gravel beside us, and the driver rolled down the window and shouted over to us, "thru-hikers?" We smiled and nodded. "Hop in!" We loaded two packs into the trunk. Isis and Blade clambered into the backseat with the third. The powerful reek of week-old sweat filled up the hot interior of the car, but the driver seemed not to mind. "I hiked northbound in '88," he said. As we sped down the two-lane road to Gorham, New Hampshire, we exchanged names and hiking stories. He stopped in the driveway of a large B&B at the edge of town. The gray building just ahead of us, an old hay barn, had an A.T. sign by the door, and a crowd of familiar people longed on the strip of lawn beside the driveway. "Welcome to The Barn," the driver said. A look of nostalgia stole over his face, a bemused mixture of joy and regret that we would see on the faces of many ex-hikers when they talked about the Trail. "Make the most of your hike. It doesn't last forever." We thanked him and the battered station wagon pulled out of the drive and was lost in the stream of traffic. They proceeded to pig out - a frequent occurrence for thru-hikers when they hit town. Two of them each ate "The Stomper," a pizza that measured one hundred and ninety-two square inches! Long-distance hiking burns a lot of calories. If you enjoy The Barefoot Sisters Southbound, you're in luck. Because Isis and jackrabbit (Lucy and Susan Letcher) "yoyoed," turning around and hiking back to Maine. And they wrote a book about that, too: The Barefoot Sisters Walking Home. I enjoyed that one too.